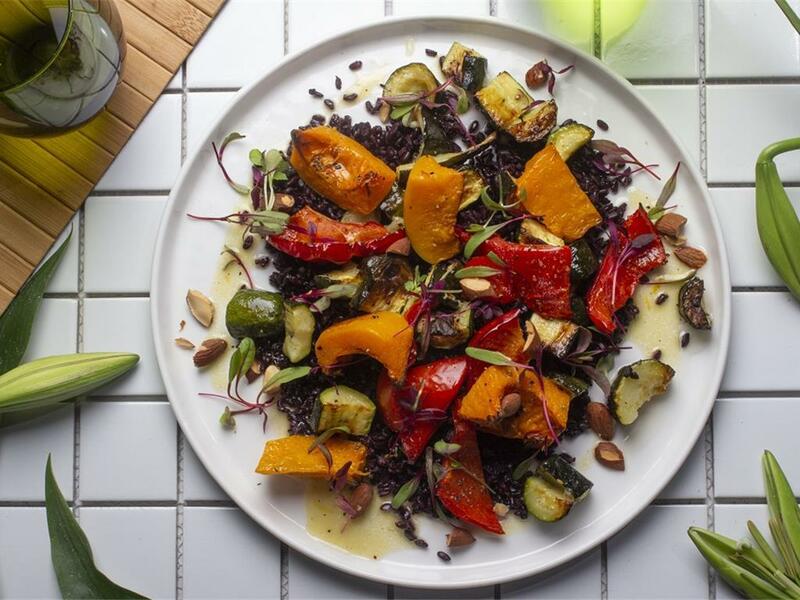 Black rice topped with roast veggies, drizzled with a mustard dressing & fresh parsley. Roast veggies: Place the butternut, courgettes, bell pepper and red onion wedges on a tin foil lined baking tray. Drizzle with olive oil, season with salt and pepper then mix and arrange in a single layer. Make sure not to overcrowd the tray (rather use two trays). Roast for 35 minutes until golden and cooked. Black rice: Place a pot on medium-high heat and add boiling water (2½ cups for 4; 1¾ cups for 2) with a pinch of salt. Add the black rice and boil gently for 15-20 minutes until cooked but still slightly chewy. Drain. Mustard dressing: Mix together the Dijon mustard, zest and juice of the lemon, garlic and HALF the parsley. Whisk in the olive oil (4 tbsp for 4; 2 tbsp for 2) and season with salt and pepper. Serve the black rice mixed through the roast veggies, drizzle over the mustard dressing and top with almonds and the REST of the parsley.